Through Stakeholder Communications, Ethical Performance broadcasts the latest Corporate Social Responsibility, Sustainability or Citizenship Reports and CSR-specific announcements. Each Stakeholder Communications article highlights a specific corporation or organization's efforts. 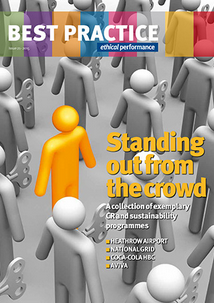 Since 1999 Ethical Performance has been working with and providing news to those who are responsible for leading CSR and sustainability practice and those who need to understand, learn and be influenced by that practice. Our network covers a wide range of industries and organisation types around the world. As well as daily and weekly news updates, we publish a monthly newsletter as well as a quarterly supplement, Best Practice, which details case studies of exemplary practice in CR and sustainability.